It appears the lawsuit against @Hodlonaut could be the first of many, especially considering the sheer number of people and organizations which deny that Craig Wright is Satoshi. Those denying Wright’s status as Bitcoin creator could face legal repercussions, as CoinGeek warns ominously. Wright is now demanding that @Hodlonaut tweet an apology and make a statement in open court acknowledging the “falsity of the allegations made against Wright.” The issue, however, is @Hodlonaut is an anonymous alias. The @Hodlonaut account has since been deleted, likely to protect the person behind the account from potential harm and harassment following the bounty. 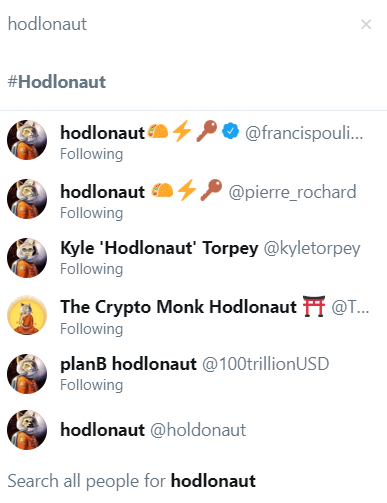 After @Hodlonaut deleted their Twitter account, many users began to change their profile pictures and usernames to signal their support. Supposedly, the proliferation of look-alikes may confuse those trying to identify the real person behind the account. This article was originally published by Cryptoslate.com. Read the original article here.